Border crossings are one of the most feared and off-putting parts of riding internationally, but what’s the truth behind them? In this issue of Australian Road Rider we dispel the myths and learn how to love these bureaucratic barriers. Back home again, we’ll take you touring in central NSW, central Queensland and the Flinders Ranges. 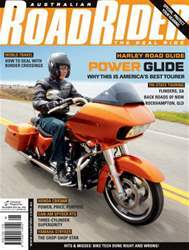 This month’s bike tests include Harley’s long-ranging Road Glide, Can-Am’s beefier three-cylinder Spyder, Honda’s hugely popular CBR300R and the tough-looking Yamaha Stryker. We also investigate the damage we do to our ears every time we ride, and find out how to avoid it. You’ll laugh and cry at our feature on the good, bad and ugly things that are now part of motorcycling’s history. Along with our news, columns and more, there’s plenty of great reading in issue 109 of ARR.